Question: Who owns the top pick overall in the next PBA rookie draft and how does the PBA determine the order of selection? 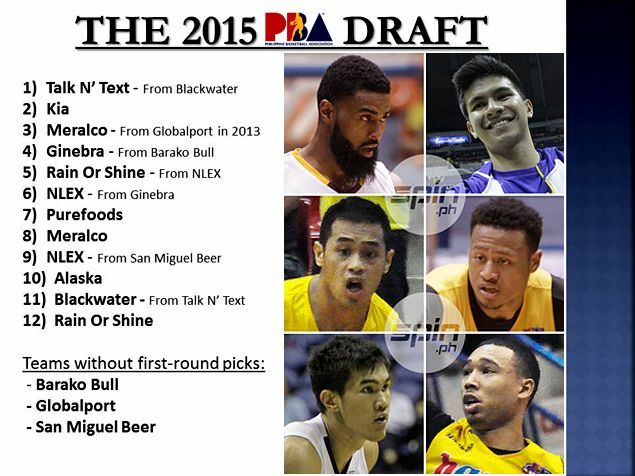 Answer: Before we answer the question about the order of selection, allow us to point out that the PBA rookie draft proceedings has been changed by the board since the controversy spawned by the draft lottery last year. Just months after Rain or Shine questioned Commissioner Chito Salud's handling of the draft lottery won by GlobalPort [to give you a refresher, see Guiao hits out at draft lottery's lack of transparency: 'Parang salamangkero si Kume'], the PBA board decided to do away with the draft lottery altogether. Starting this year, the board ruled that the order of drafting will be determined entirely by the performance of the 12 teams in the ongoing 2014-2015 season, with the worst team picking first, the second-worst team picking No. 2 and so forth. Here's also an important note: the performance of the teams will be based on their finishes in the three conferences of the year, with the all-Filipino Philippine Cup accounting for 40 percent of the tabulation and the two import-laced tournaments - Commissioner's Cup and Governors Cup - accounting for 30 percent each. Also, the teams will be ranked according to their finishes in each of the three conferences and not their aggregate win-loss records. Remember, the performances of the teams in the season-ending Governors Cup will still carry a 30 percent weight in the final order of selection in the next rookie draft, which is expected to feature a deep, talent-laden pool that includes Fil-Tongan Moala Tautuaa, Bobby Ray Parks, Troy Rosario, Chris Newsome, Garvo Lanete and - who knows - maybe even Kiefer Ravena. So unless Blackwater improves by leaps and bounds in the Governors Cup, the expansion team will likely end up with the No. 1 selection overall in the draft. But the sad part is, the Elite have already swapped first-round picks with Talk 'N Text when they acted as the third team in an early-season deal that allowed KG Canaleta to move from Talk 'N Text to NLEX and rookie Kevin Alas from NLEX to Talk 'N Text. Blackwater got Larry Rodriguez from that deal. Aside from that, there are also various trade deals that will change the order of drafting. In the final reckoning, it is important to note that the MVP group will end up with five first-round selections (one with Talk 'N Text and two each with NLEX and Meralco), Rain or Shine will have two (including one from GlobalPort), Ginebra can go up to as high as No. 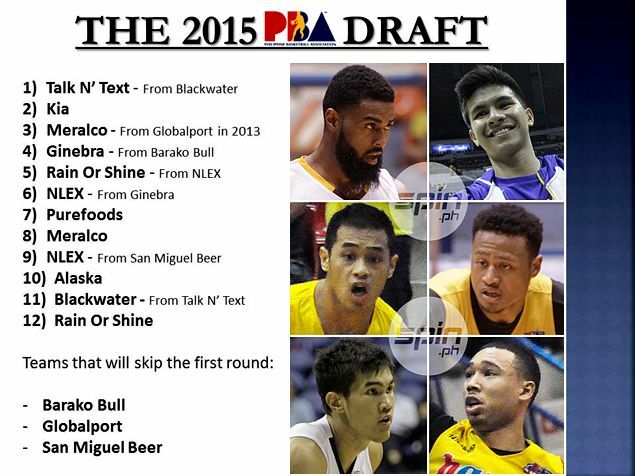 4 with the first-round pick it got from Barako Bull in the James Forrester/Dylan Ababou deal, and three teams in San Miguel Beer, GlobalPort and Barako Bull won't even get a chance to pick in the first round. So unless a drastic shake-up in the league hierarchy happens in the Governors Cup, we will likely see Tautuaa or whoever Talk 'N Text desires end up in the MVP camp after the 2015 rookie draft.